Desk-Top BB4 is a 1 way loudspeaker that employs a Omnes Audio BB 4.01 fullrange chassis. 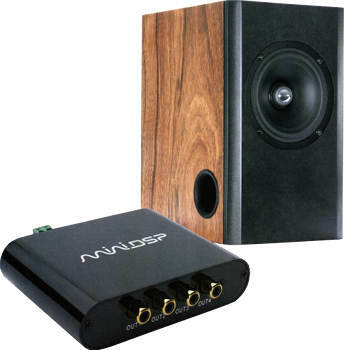 The frequency response smoothing can be realised passive, or with an DSP. Desk-Top BB4 has been developed by Bernd Timmermanns. The crossover consists of a 1st order low-pass filter (6 dB per octave slope) for the fullrange driver to smoothen the frequency response. In addition four parallel RCL absorption circuits smoothen the frequency response. Between 60 Hz and 20 kHz, the frequency response of this loudspeaker is flat on axis. The decay spectrum is nearly perfect. At low volume, i.e. 90 dB at 1 m, the nonlinear distortions are below 1% above 250 Hz and below 0.3% at 80 dB/1m. L2 has a DC-impedance of 3.5 Ohm. In the journal has been a printing error. R2=6.8 Ohm because L2 has a lower DC-impedance. Instead of a passive crossover we also deliver a pair of loudspeakers with digital signal processor (DSP). The DSP does his work between preamplifier and power amplifier.